If you are looking for information on the Remedy Intelligent Staffing franchise business opportunity, Remedy Intelligent Staffing franchises or Remedy Intelligent Staffing franchising, then you have come to the right place. Help yourself to a new life. There's something very rewarding about helping good, qualified people find employment and helping businesses find the capable people they need. As a Remedy franchisee you truly have the opportunity to make a difference in people's lives. If you're going to own your own business, why not make it highly satisfying work? Target an expanding market. Meet the demand with Remedy. The U.S. staffing industry has already reached $87 billion and is predicted to be one of the fastest growing industries in coming years as employers look for flexibility, cost savings and immediate access to talent. 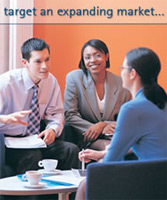 The industry consists of companies providing temporary help and direct placement recruiters. With Remedy you can provide both, in office and light industrial environments. The Remedy Brand stands for intelligence and innovation. Remedy continually develops intelligent and innovative solutions to solve clients' problems. Our proprietary technologies deliver unparalleled worker performance and cost management. Our recruiting methods attract the best talent for our customers. 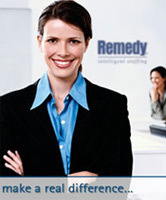 As a Remedy franchisee, you share in Remedy's brand name recognition and reputation for financial stability. When the national Remedy brand is combined with a franchisee's local market commitment, the results can truly be outstanding. Be a part of the dynamic Remedy team. 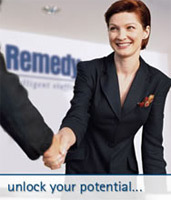 Remedy franchisees are among the most successful, dynamic, generous people you will ever meet. Many of our team were executives with major corporations prior to joining Remedy. You will benefit from their experience and camaraderie. You will also benefit from our size. Remedy is part of The Select Family of Staffing Companies, a top 10 staffing firm with over 300 offices nationwide generating annual sales of over $1 billion. Such vast support enables you to serve your clients with greater resources and offer more job opportunities for your job candidates. Benefit from Remedy's total support. The in-depth President's Training Program teaches you the business. What are you waiting for? Put your talent and energy to work for you and your family now. Remedy's flexible business model provides a way to enjoy the benefits of being your own boss while having the camaraderie and corporate resources of a national public company. Maybe the corporate ladder isn't moving you fast enough toward your goals. Or the thrill may have gone out of your job. If you are looking for the opportunity to enjoy your work again, be your own boss and create something truly meaningful, then your dreams can become a reality with a Remedy franchise. We're growing the Remedy Intelligent Staffing brand nationally, with aggressive expansion plans. As part of our expansion plans, we have discovered many high-growth markets ready for talented, dedicated franchisees ready to grow their own business and open the door to your future.